If you were to buy an apartment in the Vancouver area today, how much of your monthly payments would go to the Strata Council? The chart below shows estimates of what percentage of your monthly housing costs (including strata, mortgage payments, and property taxes) would be accounted for by strata fees. This article presents estimates of how much strata fees will cost you as a proportion of your monthly payments. We break up monthly strata fees by area and by whether or not the unit is new or a resale. Strata fees vary by area (with Downtown Vancouver predictably having the highest strata fees) and by age of the building. Make sure you look at strata fees for comparable buildings to make sure that you are not over paying. Strata fees can represent a significant proportion of your monthly carrying costs for an apartment in the Greater Vancouver Area. Whether you are considering purchasing an apartment as an investment, or as your first home, take a close look at monthly strata fees and available strata documents. While they are admittedly dull, they can contain very important information. A casual review of the graphs above show some important information for prospective buyers: - While price per sq. ft. is lower outside of the downtown core, strata don't vary as much. 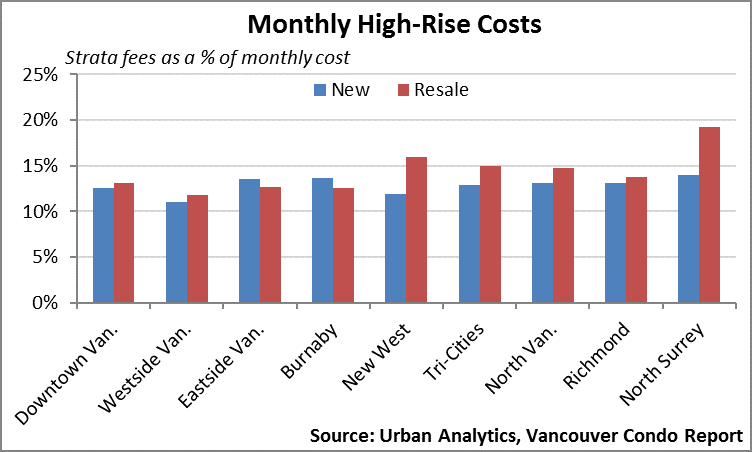 As such, strata fees in North Surrey, Langley, and Pitt Meadows will make up a higher proportion of your total monthly housing costs compared to Vancouver and Burnaby; and - Strata fees tend to make up a larger proportion of monthly housing costs for resale apartments when compared to new apartments currently being marketed. Insurance and maintenance costs are not accounted for in this analysis. Strata fees obviously vary according to the level of amenities provided. They also vary according to area and the age of the apartment. That being said, you should still be aware of what typical strata fees are and ensure that you are not overpaying. People have a habit of focusing on the sticker price of homes, but they should really be focusing on the monthly costs, which would be a better gauge of affordability.